Attracting wildlife to your back yard requires that you think beyond traditional landscaping techniques which normally do not meet the needs of wildlife. Wildlife have four basic requirements for survival: food, water, shelter and space. If you can develop a landscape plan which provides these elements, you stand a good chance of success. The types of wildlife you plan to attract will determine what types of food you should provide. Food preferences may fluctuate and amounts required change as the seasons change. In addition, young wildlife require different foods than adults. You can provide basic food requirements naturally through landscaping with plants that produce berries, nuts and seeds; artificially by supplementing food in a variety of feeders; or by using a combination of both methods. By providing a diversity of food types, wildlife can utilize your back yard in all seasons. When selecting plants to do your landscaping, choose an assortment with fruits and nuts which mature at different times. Following this line of thinking will allow you to provide a food source during summer, fall and winter. Adding a variety of native grasses and forbs such as maximillian sunflower or bluestem, that produce seeds utilized by songbirds, will add to your menu. Finally, you can provide alternate food sources through feeding stations, designated food plots and specialty items. Most bird migrations in spring key on the amount of available daylight (photo period) and weather patterns, specifically the average rise in temperature. Coinciding with increases in temperature during initiation of spring is the beginning of the insect hatch. Songbirds, such as the bluebird, purple martin and swallow, feed primarily on insects and therefore follow warmer weather as it moves north triggering insect life. Other birds like the meadowlark migrate north based solely upon the photo period and weather. They feed on waste grain and old grass seed until plentiful insects are available. Finally, songbirds like the sparrows need not worry much about insects at all since they rely on grasses and forb seeds year round. Foods which are available June through August are considered summer foods. Fruit bearing native shrubs and trees make up a substantial amount of what you can plant to benefit wildlife during these months. These species include things like chokecherry, nanking cherry, American plum, golden currant, sand cherry, juneberry and freedom honeysuckle. Vines such as riverbank grape also produce an excellent berry for wildlife and can create nesting cover for birds and a visual barrier between properties. Fruit-bearing plants attract birds and other wildlife including waxwings, orioles, brown thrashers, gray catbirds, rufous-sided towhees, American robins, deer, grouse and pheasants. Not only do these small to medium-sized species provide food for both you and wildlife, they are dense and excellent nesting cover for birds if not trimmed. Also included in the list of beneficial food sources for wildlife are those plants which can be introduced into your backyard wetland. Aquatic organisms and other wildlife species are attracted to wet areas and feed upon available vegetation. Smartweed, bulrush, pondweed, duckweed, and cattail are important sources of summer food for wildlife and should not be overlooked. Seeds and fruits which ripen in the fall are of particular importance to migrating birds. They allow birds to build up fat reserves to make it through the long journey south. It also is important to resident wildlife species who normally require large fat deposits to burn throughout our long winters. Fall foods include the berry producing plants referenced above, grains like black oil sunflower, corn and seeds from native plants like maximillian sunflower and goldenrod. 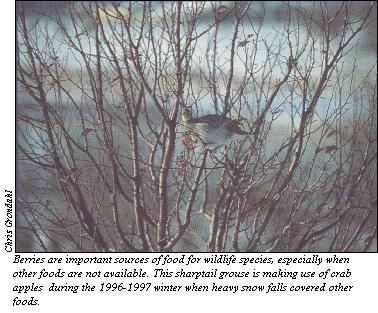 Searching for food in the winter often burns most of the fat reserves that wildlife have put on during the fall. Therefore, it is very important wildlife are able to find food during a certain percentage of their travels. Many of the best winter wildlife foods are characterized by two qualities: persistence on the branch or vine and low appeal during the fall. Persistent berries are those which remain on the plant long into the winter and include species like hawthorne, hackberry, Russian olive, Siberian crab, mountain ash, American cranberry, sumac, snowberry and bittersweet. Many of these same berries are initially unpalatable for wildlife and require times of freezing and thawing before they are desirable. Berries which persist late into the winter are extremely important because they are available at a time when other natural food supplies are limited or covered by snow. Songbirds and game birds benefit substantially from food like this that has been "preserved" for rough times. Plants that produce acorns and nuts also fall into this category and include species like bur Oak, black walnut and beaked hazel. These species are of particular importance to white-tailed deer, squirrels, wood ducks, and wild turkeys. They are also significant additions to your back yard as long term investments because they provide added beauty and shade. Wildlife species can also feed upon fallen fruit after snow melts in the spring. Refer to Appendix A which discusses heights, wildlife values and other aspects of trees, shrubs and vines in more detail. Finally, there are alternate sources of food for wintering wildlife. 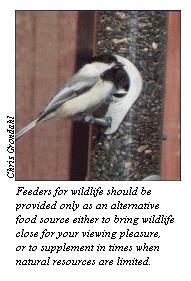 Alternate food sources consist primarily of grains such as black oil sunflower, corn, suet, and fruit fed through use of wildlife feeders (Refer to Constructing Nest Boxes, Feeders and Photo Blind for North Dakota Wildlife, a publication available from our Department which provides plans for various wildlife feeders). Feeders should not be provided as the only source of food but rather as an alternate source when mother nature's is in short supply and as a method to lure wildlife close to our back yards for viewing purposes. Be aware that enticing wildlife species such as deer close to your home can result in damage to other plants and materials you value. Thoroughly think through your plan before beginning your feeding program. You may want to limit feeding to songbirds only (Refer to Backyard Bird Feeding, a guide available upon request from the Game and Fish Department). Planting large tracts of grains and other valuable forbs and grasses, with the intention of leaving some for wildlife, is fairly maintenance free and better for wildlife than a feeding station. Keeping larger mammals and game birds away from disturbances associated with humans will help reduce stresses already brought on during the winter and help keep wildlife wild, as the term implies. Even though food plots are normally thought of as areas encompassing a number of acres, smaller areas of a few hundred square feet can be beneficial for songbirds and other small wildlife. The value of smaller food plots are particularly important when discussing the needs of bees, moths, butterflies and hummingbirds. Almost any yard has the space to plant an arrangement of flowers that will attract butterflies. Not only will you be happy with the opportunity to view butterfly species that used this area but also by the aesthetic value added by such a planting. Seeing butterflies may not be difficult. In fact, most of us have seen these winged creatures fluttering across our yard at one time or another. The real challenge is knowing enough about them to attract a variety of species over the entire season. Butterflies require two types of food--food for caterpillars and nectar for adults. Providing food sources specifically for caterpillars can be accomplished with many different types of plants. Some of the best trees include willows, birch, oak, hackberry and nanking cherry. Favorite flowers include members of the family Asteraceae like black-eyed susans, purple cone flowers, clovers, marigolds and zinnias. Other plants such as certain grasses, legumes, herbs, and sedges also provide favorite nourishment. Whether or not you have plants in your own yard that caterpillars need should not effect your ability to attract butterflies. Most caterpillars will find adequate sources of food somewhere in your area and be attracted to your yard once they become butterflies. 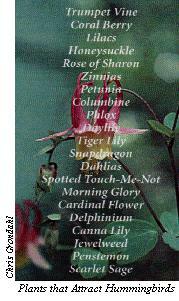 You can provide nectar sources by providing a variety of flowers. Generally, white and purple colors seem to be favorites for butterflies and tend not to attract as many bees as do yellow flowers. 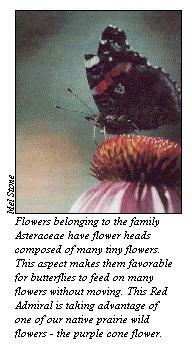 Flowers of the family Asteraceae are favored by butterflies in search of nectar. This family of flowers is represented by flower heads which are composed of dense clusters of small flowers surrounded by a ring of small leaves. They provide excellent sources of nectar because butterflies can access numerous flowers without flying from plant to plant. Plant a variety of species of flowers to get the largest variety of butterflies. A butterfly uses plants which are in bloom. Choosing species of plants which bloom at different times during the growing season will provide nectar sites for butterflies maturing at varying intervals throughout the season. In the beginning of the summer, dogbane, wild bergamot, bull thistle and milkweed are native plants that will attract many early butterflies such as the hobomok skipper, silver-spotted skipper, and tiger swallowtail. Later in the summer, these plants and others will attract hairstreaks, white and red admirals and fritallaries. The popular monarch butterfly can also be attracted to your yard. This species' caterpillar relies entirely on the milkweed plant for food. 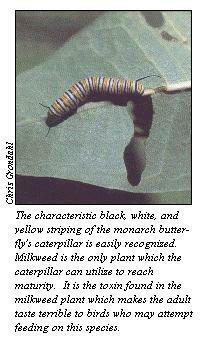 By providing milkweed plants, you can be almost certain to find caterpillars feeding on the leaves of the plant. Fall maturing wildflowers like the purple coneflower and some of the asters become important during this time period for butterflies like the prairie skippers and painted ladies. 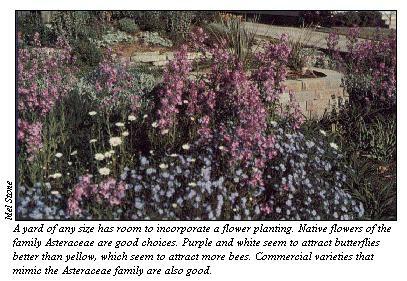 All of the plants mentioned above are native plants and should be used to attract butterflies. One cannot overlook, however, the importance of some of the commercial species of flowers like the marigolds, zinnias, dames rocket and liatris. These flowers mimic the looks of the wild Asteraceae family species and therefore are excellent attractors of butterflies. High nectar content of these species also makes them favorite of many butterflies. Placement of a butterfly garden can be important to afford maximum butterfly use. Butterflies enjoy calm and sunny areas to feed. Putting in a garden plot on the south side of your house will offer maximum sunlight and some protection from prevailing winds. Other locations on larger tracts of land may include a clearing within a dense area of woods. Also try an unpeeled banana to attract butterflies. Simply make slits in a fresh fruit and place it in a closed container until the banana becomes soft and juicy. Place the banana on a tray near a window and see what happens. Refer to Appendix B for additional information on butterflies. 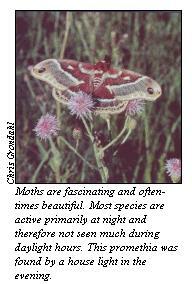 Attracting moths is a difficult task since most moths are active at night. Larval forms may be lured into your area by certain plants but the fact they are limited in numbers makes it just a chance you will have the opportunity to view one. If you want to view moths, a black light source at night is the best way. A black light is the type of light used in the "bug-zapper" once sold in large numbers to "control" insects. What actually happens is that insects are attracted to your yard from great distances and then killed by the electric cage around the black light. This type of product actually is detrimental to moths and other beneficial insect populations. state but birds can be viewed in other parts of the state for short periods of time during the spring and fall migrations. 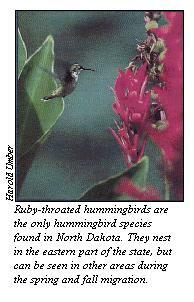 To attract hummingbirds to your yard, plant large flowers with high nectar levels or provide a nectar feeder. Nectar is the sole source of food for these birds and they require frequent feeding because of their high metabolism. Nector feeders can be purchased locally and filled with a sugar and water solution of 1-part sugar to 4-parts water.